dog rescue people this time of year. The work they do day in and day out is amazing. The world is certainly a better place for them. animal rescue people, or organizations this time of year. wire and sisal, it was easy for me to curl his tail a bit like our Cody Bear's tail is. He also got some dry brushing of white paint to make him a little whiter. white paint made this one look more like our pup. And he goes perfectly with the bleached bottle brush trees. Thank you for reminding people to donate to animal shelters this time of year. We have two cats and two dogs - all rescues. I'm Donna who bleaches bottle brush trees and now following with Bloglovin'. Thank you to you as well Donna for being a rescue mom! Merry Christmas! 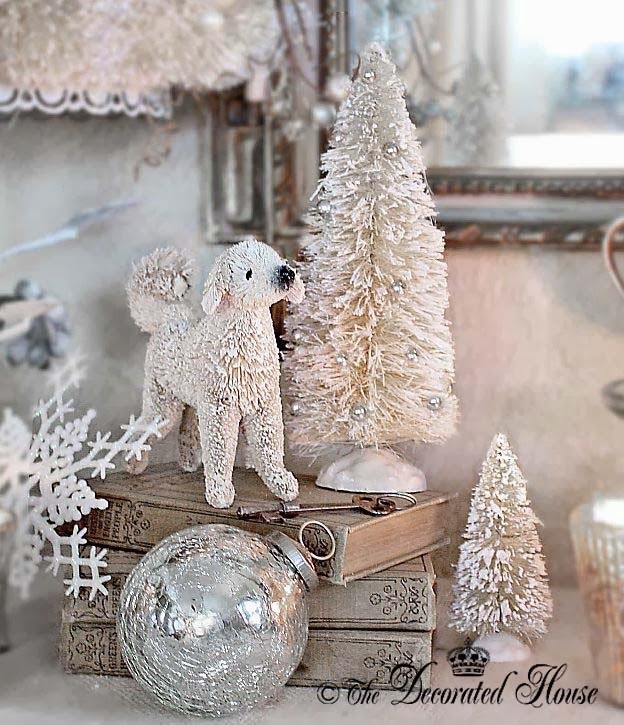 Beautiful vignette, Donna! It's wonderful that Cody found a new home with you. Our cats and dogs are rescues too. Our cat Barney just sits on my lap and purrs :). Merry Christmas Julia to you and your wonderful four paws sweeties! So nice to see you. Thank you for always taking the time to leave your sweet notes. Love, LOVE, L O V E the white bottle brush trees, dear friend!!! 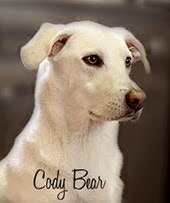 I'm sure your Cody Bear had an Angel to guide him to your home. Hello Pat, Thank you for coming by and taking a moment to write your kind note. Yes, we know how lucky we are that Cody Bear waited for us to come along. He is a loved dog. Beautiful! If I had a large piece of land, I would adopt sooooo many! I know what you mean. So many times I think how much work it would be, but oh so rewarding, to have enough land to help more animals. The people who do that are amazing! Boy thank you for this post. We have two mini doxies that are brother and sister. They are the love of our lives. I see so much animal cruelty on the pages of FB and it just rips my heart out. I look at our two babies and can't even imagine hurting and mistreating something that just wants to be loved so unconditionally. Animals should never be forgotten especially during this time of year. It will always amaze me how really unconditionally our beloved animals do love us. Well, actually Cody is a little treat monster, he only does what you want him to if he sees a treat. But he is still the best companion we could ever imagine. It so warms my heart to see all the people who do love their dogs (and cats) and give them the best home they can. This is an excellent reminder to donate to an animal shelter!! Where would our lives be without the beloved pets who grace our lives by putting their sweet souls into making our house a home? Your ornament is so special! You really did make it look like Cody Bear. Interesting post for me as I have felt so blessed all morning by our beautiful Coco the Cat. Thank you Constance! I'm sure sweet Coco feels the same way about you! I would love to see the real Cody Bear all decked out in Christmas finery! !